Redmond is hosting its first Open Streets Event. Bring your bike, scooter, or skateboard or simply walk the event along closed down Deschutes Avenue and enjoy games and activities. 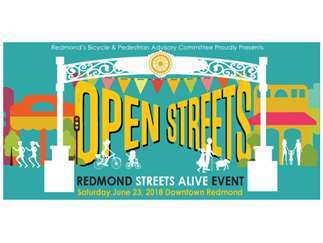 Redmond's first Open Streets Event will occur on Saturday, June 23rd from noon-4 pm in downtown Redmond. This is a FREE, family friendly event that temporarily closes a portion of a downtown street to automobile traffic, so that people may use it for walking, bicycling, skateboarding, scootering, dancing, playing, and socializing. What do you do at the event? There will be activity centers along the street to encourage people to have fun and linger and learn more about City plans for improvements to walking and biking. Plus, the Redmond Streets Fair will occur the same day along neighboring 6th Street offering vendors, food, crafts, entertainment and more. Visit both events! * Create new opportunities for businesses to engage the community When is it?